So —- meal planning while eating on the AIP (Autoimmune Protocol) diet is hard. Especially for me. Something you’ll learn about me is that I like to save money wherever I can, even while eating a super-healthy diet and steering clear of cheap, processed foods (it’s no accident that 1) these foods are cheap as dirt and 2) most of the coupons floating around out there are for these items)). While our local GIANT Food Store offers an OK selection of organic meats, I refuse to buy an expensive cut of organic meat at full price, just because I’ve been having a hankering for a pork chop or a nice steak. I ALWAYS buy 2-3 packs of whatever meat is on sale (more if it’s a REALLY good price to stash in my freezer) and plan my menu for the week around those items – a process which has led to some pretty intersting meal combinations (most pretty good, some definitely not!). I’m a a big fan of having my meat mixed in with my veggies, rather than just a big hunk of it on my plate. That being said, I’ve become pretty creative over the last year with my meals, and have created a general, rule-of-thumb equation, so to speak, for a fool-proof easy AIP meal, with any type of meat, vegetables, fats and seasonings you are currently craving! It’s kind of a cross between a stir-fry and a salad. You’re intrigued now…I know you are! FOOL-PROOF QUICK AIP DINNER EQUATION – ENDLESS MEAL COMBINATIONS AND NUTRIENTS AHEAD! the perfect savory and filling AIP meal, every time! Did I mention that these are 1-skillet meals?? Just icing on the cake, right?? 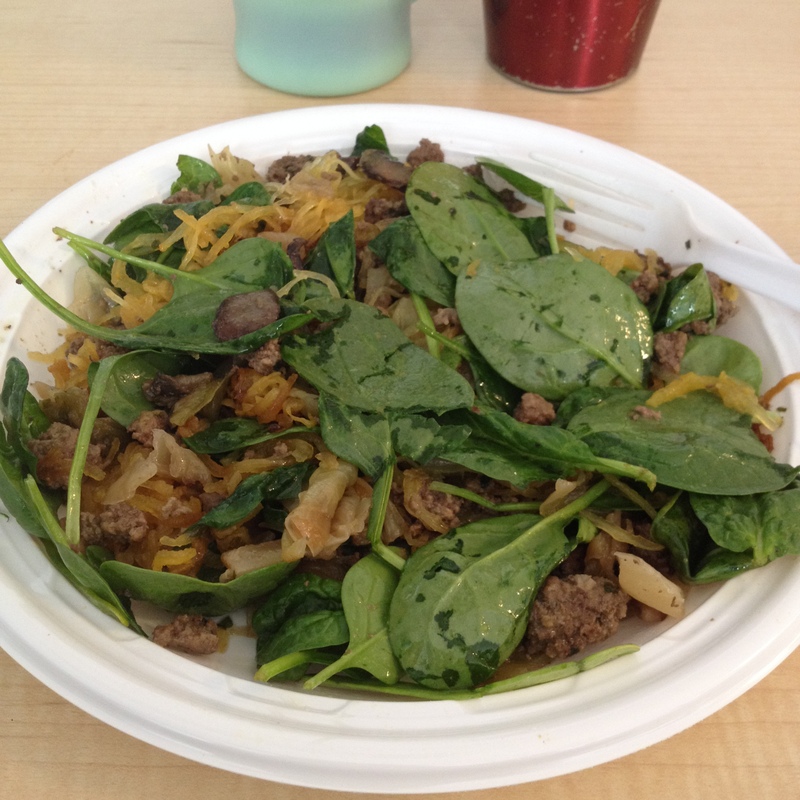 Here is my latest meal creation using my Fool-Proof AIP Equation – Ground beef stir fry with cooked cabbage, mushrooms and spaghetti squash on top of fresh spinach! It’s not the prettiest picture, but you get the idea – it was a lot prettier before I mixed it up and it was really savory and juicy. While that’s baking, brown your ground beef in the skillet at low-med heat. I did not strain the fat from my meat because it was organic. In conventionally produced meat, toxins are stored in the fat, so if you aren’t using organic meat, strain it first. In the same pan, add a tablespoon (or less) of desired cooking oil and toss in cut up veggies and desired seasonings – I cooked my cabbage for about 5-10 minutes on med heat to get a little brown, before adding the mushrooms. Cook your veggies to your liking on low-med heat – I like mine tender and juicy but not soggy! Transfer veggies to serving bowl and mix in with the ground beef. When the squash is finished cooking, let it sit for a few minutes to cool and then scrape out the insides with a fork and transfer to your serving bowl, or keep it hot in a separate container. Divide your spinach on your dinner plates and pile the meat and veggies mixture on top – I added some of my homemade apple cider vinegar dressing, which gave it JUST a little bit of tang that went great with the spaghetti squash. This was my lunch two days in a row and I was totally okay with that because it was really yummy and didn’t upset my stomach at all or my UC symptoms from what I could tell. Speaking of UC symptoms, I’m doing well right now. No blood for the past couple of days, which is very exciting. Other aspects could be better (passing some mucus, a bit of bloating and gas) but one step at a time, right? What are your fool-proof breakfast/lunch/dinner AIP recipes??? I want to hear them all, so please leave me comments and links below! I’ve been obsessed for the past couple of days with gathering AIP recipes on Chowstalker – check it out if you have an hour or two to spare!